The annual TNT Wooden Spoon Golf Day took place at Stoneleigh Deer Park Golf Club on Thursday 8th September and celebrated a 20 year partnership between TNT and the Wooden Spoon charity. TNT employees, customers, suppliers and England Rugby player, Andy Gomarsall all took part, with over £25,500 being raised for the charity on the day. 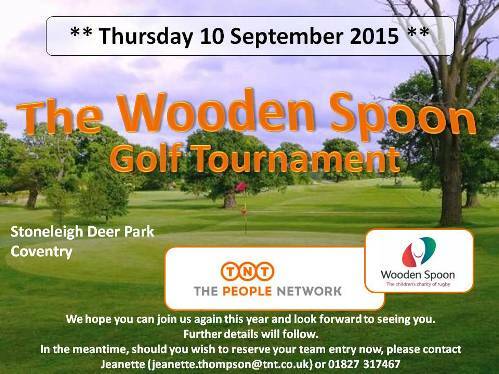 Stoneleigh Deeer Park Golf Club hosts the Annual TNT Charity Golf Day held in partnership with the Wooden Spoon Charity. Wooden Spoon was founded in 1983 and since then we have been making a difference to the lives of disadvantaged children and young people. Supported by our volunteer committees and their great fundraising ideas, we make sure that all the money raised stays in the local community to fund local projects. Wooden Spoon is one of the largest funders of respite and medical treatment centres, sensory enhancement therapeutic facilities, specialist playgrounds, sports activity areas, and community-based programmes in the British Isles. So far we have granted over £20 million to these fantastic projects. Inspired by our rugby heritage, our values of passion, integrity, teamwork, and fun have so far helped over 1 million young people and children in need. We are honoured to have HRH The Princess Royal as our Patron, and in 2011 Wooden Spoon became the first charity to receive the International Rugby Board's Spirit of Rugby Award. With the generous team spirit of the rugby community and the help of its top sporting heroes, our projects truly make a difference. We are very excited about our ambitious plans for the future, too! Wooden Spoon is excited to have been announced as the Official Charity Partner for Rugby League World Cup 2013 in England and Wales to further cement its status as the charity of rugby. The RFL became a patron of Wooden Spoon in 2009 and since then has worked tirelessly alongside us on community programmes aimed at significantly improving the lives of 16-19 year olds who are currently not in education, employment or training." Aaron James, Sports impressionist and stand-up comedian participated in the golf day and entertained everyone as the after dinner speaker, took time out for a photo opportunity with 'Spoony 'and the Rugby League World Cup 2013 which was on display during the event. A total of over £26,000 was raised for the Wooden Spoon Society Charity from the TNT Golf Day 2013.